The browser-based Eggplant Automation Cloud interface lets testers reserve devices through Eggplant Automation Cloud for use with Eggplant Functional. Administrators will need to provide users with login credentials (username and password) as well as the IP address or URL to access the Eggplant Automation Cloud web portal in your environment. Dashboard, where information about active and upcoming reservations can be viewed. Reservations, where users can view and make reservations. Account, where users can update email addresses and change passwords. 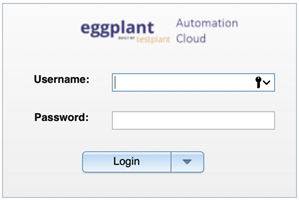 You also use this link on the main Eggplant Automation Cloud menu to log out of Eggplant Automation Cloud. The main navigation menu in Eggplant Automation Cloud also includes a link for Documentation, which takes you to the website for Eggplant Automation Cloud documentation.